The National Research Institute for Cultural Properties will feature reports on the activities of the Institute every month on its website. The aim of this Monthly Report is to provide the most recent information concerning the various activities undertaken by the Institute as a whole or by its individual Departments and Centers. 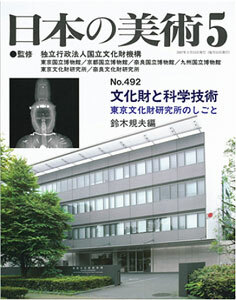 For example, in this issue a report is made of investigation conducted by researchers on damages caused to cultural properties by the earthquake that shook the Noto Peninsula on March 25 within a month of the disaster. There is another report on the various activities undertaken to conserve the mural paintings of the Takamatsuzuka Tumulus. Nihon no Bijutsu No. 492, Cultural Properties and Technology: The Work of the National Institute for Cultural Properties, Tokyo (2007, Shibundo, 1650 tax inclusive) has been published (in Japanese). This book discusses various matters related to cultural properties by referring to actual cases of investigation and research employing technology. 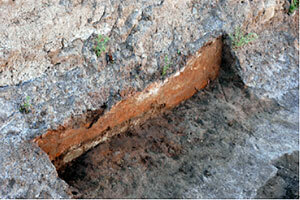 These matters include: scientific investigation of cultural properties, conservation environment and deterioration, assessment of restoration materials and techniques as well as their improvement and development, conservation of modern heritage, international cooperation and scientific technology in the conservation of cultural properties, cultural properties that are not tangible and their techniques as well as methods for their documentation. Publicizing information on the Institute’s collection of periodicals in Japanese and the improvement in service at the Library. The Institute has a collection of a great number of periodicals related to fine arts and has published and made available to the public an inventory of these periodicals. From April information concerning the Institute’s collection of periodicals in Japanese has been added to the information retrieval system and is available on the web site. One of the characteristics of the Institute’s collection is that it includes many periodicals related to fine arts that were published from the Meiji to the early years of the Showa periods. These periodicals are also valuable in that they provide historical information, such as that related to paper and printing techniques employed, of different periods. As is the case with many cultural properties, these periodicals must be conserved but must also be utilized. In order to conserve these periodicals, the Institute is making microfilms and CD-ROMs of these periodicals, taking into consideration the extent of deterioration, frequency of their use and other factors. With regard their utilization the public can access these microfilms and CD-ROMs while the originals are treated as valuable documents to be used only upon special request. In April 2007 the National Research Institute for Cultural Properties and the National Museum, both Independent Administrative Institutions, were integrated to form the Independent Administrative Institution, National Institutes for Cultural Heritage. On this occasion, works by Kuroda Seiki in the collection of the Kuroda Memorial Hall were exhibited in the Thematic Exhibition Room on the first floor of Heiseikan, Tokyo National Museum (April 10 to May 6) . Fourteen oil paintings and 8 sketches dating from the time Kuroda was studying in France to his later years were exhibited, including a representative and the most widely known Lakeside (nationally designated Important Cultural Property). These works introduce the essence of the art of Kuroda Seiki who revolutionized the mid-Meiji period world of western-style paintings in Japan through a new form of visual expression based on an awareness of plein air and color and supported by liberal philosophies. Since the exhibition “The Mind of Leonardo – The Universal Genius at Work” was being held at the Museum during the same period, there was a record number of visitors, many of whom were able to appreciate the works of Kuroda as well. In that sense, this was a very good opportunity to make the works of Kuroda known to the public. Works by Kuroda will continue to be exhibited at the Kuroda Memorial Hall as before on Thursdays and Saturdays. The public will also be able to view the results of research on the artist and his works. The second of the series of exhibitions on the works of Kuroda is scheduled to be held at the Tokyo National Museum from November 6 to December 2. A meeting of experts on the UNESCO Convention for the Safeguarding of the Intangible Cultural Heritage was held for three days from April 2. Twenty-nine experts on intangible cultural heritage from various nations attended this meeting, which was sponsored by UNESCO and the government of India, at New Delhi. 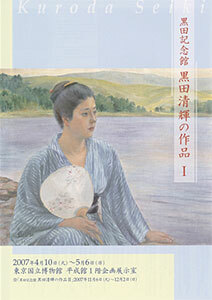 From the Institute, Miyata of the Department of Intangible Cultural Heritage participated. This meeting is an important meeting in preparation for the first extraordinary session of the Intergovernmental Committee to be held in May at Chengdu, China and the second ordinary session of the Intergovernmental Committee to be held in September at Tokyo. Discussions were held concerning the relationship between the Representative List of the Intangible Cultural Heritage of Humanity and the List of Intangible Cultural Heritage in Need of Urgent Safeguarding which are the core of the Convention, and the standards for their registration. Opinions of the experts will be used by the UNESCO Secretariat for the future implementation of the Operational Directives. However, since there was not a sufficiently common understanding among the participating experts with regard to concepts like “representativeness” and “urgent safeguarding” the discussions tended to be abstract and ended without the adoptation of any form of recommendation or the like. Although the meeting was not necessarily successful, when considering the initial purpose for which it was held, the various cultural programs presented by India, the host country, showed India’s great desire to safeguard intangible cultural heritage. 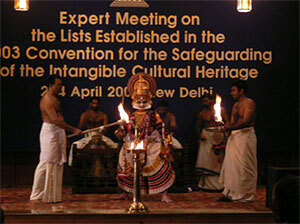 The Department of Intangible Cultural Heritage strongly felt the necessity to conduct interchange with India. An earthquake of magnitude 6.9 occurred on the Noto Peninsula at 9:42 am on March 25, 2007. As a result, large-scale damages occurred near the epicenter, including complete or partial destruction of houses and severing of lifelines. 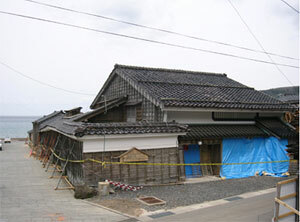 Cultural properties were also no exception to this disaster, and a total of 21 cases of damage to cultural properties have been reported within Ishikawa prefecture (as of April 4, 2007; Ishikawa Prefectural Board of Education). The Center for Conservation Science and Restoration conducted on-site investigation concerning damage caused to cultural properties by the Earthquake so that it may obtain immediate understanding of the condition and factors of damage and provide advice for emergency measures and plans for future restoration. 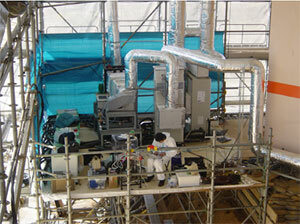 Investigation was held from April 16 (Monday) to 18 (Wednesday). Museum objects and architecture within the city of Wajima were investigated. At a certain facility for exhibiting cultural properties, urushi lacquer panels that had been hung for display had fallen because the metals used for hanging them had been broken. Many of the buildings and storehouses in the Kuroshima district of Monzenmachi near the epicenter had been completely destroyed, as was the storehouse of a museum. Although many investigations, research and measures have been conducted with regard to preventing disaster to cultural properties since the Great Hanshin Awaji Earthquake, information obtained through these attempts have not been made known throughout the nation, as became evident in this investigation. The National Research Institute for Cultural Properties, Tokyo will continue to conduct research concerning disaster prevention and to make more people aware of measures to prevent disaster to cultural properties by actively notifying them of the results of our studies. China, Japan and South Korea Cooperation Training Program for Cultural Heritage Preservation along the Silk Road held jointly with the National Research Institute of Cultural Properties of China and sponsored by Samsung Japan and Samsung China is now in its second year. For three months from the spring of 2007, two courses have been held: one for the group on the conservation of earthen structures (in its second year of a 3-year program) and the other for the group on the conservation of excavated archaeological sites and objects. In autumn a 3-month course will be held on “paper cultural properties” for the group on the conservation of museum collections. Vice Director General Zhang Bai of the State Administration of Cultural Heritage and others responsible for each discipline attended the opening ceremony for the spring course that was held on April 16 at Liangdaicun village, Hancheng city, Shaanxi province, the site for the course. Hancheng city is a historic district where buildings of the Sung, Yuan and Ming dynasties are buried. The area surrounding the city is a treasure house of cultural heritage with the Great Wall of China of the Qin dynasty and the tomb of Si Maqian located nearby. In autumn 2004 numerous tombs estimated to be those from the late West Zhou to the early East Zhou dynasties were discovered in the neighboring Liangdaicun village. Most of theses tombs had not been plundered and since much cinnabar have been found in the remains, they are assumed to have belonged to the nobles who were buried there. Particularly since many gold vessels, lacquered drums and stone gongs were excavated from tomb No. M27, it is said that four of the tombs including this one belonged to leaders of the area. 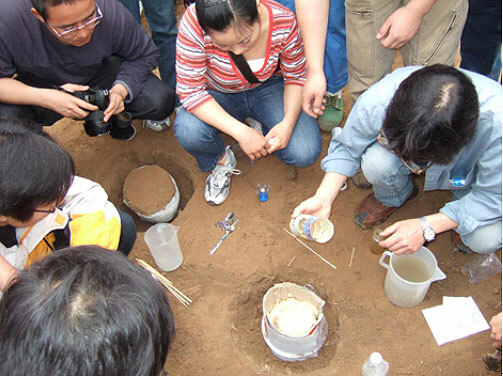 The training course is conducted with full support from the Shaanxi Provincial Cultural Relics Bureau and held at the site of a large-scale tomb in Liangdaicun village that is currently being excavated. 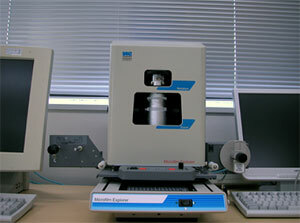 During the 3 months 12 Japanese experts will participate and work with their Chinese counterparts. From April 12 to May 18, the Japan Center for International Cooperation in Conservation sent the second mission team for the Project for the Preservation of the Buddhist Monastery of Ajina Tepa which is funded by the UNESCO/Japanese Funds-in-Trust. Ajina Tepa is a Buddhist temple of the 7th to 8th centuries where a large stupa and a huge statue of Parinirvana Buddha (12.8m in length when reproduced) have been excavated. The purpose of this project is to conserve a Buddhist temple that has been constructed using mud bricks or pakhsa (pisé). 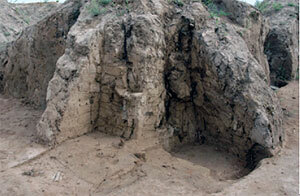 In cooperation with young Tajik archaeologists, the Center is engaged in the archaeological cleaning of the site, including removal of spoil and grasses that have accumulated after past excavations, in order to elucidate the location and structure of the walls and floor of the original Buddhist temple. As a result of this investigation, it was found that the walls of the temple were constructed with mud bricks and pakhsa blocks although some walls had been built only with mud bricks. Moreover, what are believed to be fragments of mural paintings and polychrome statues were excavated in the process of finding out about the floor of the temple. Joint work with young local archaeologists is a very stimulating experience to us and we hope to be able to contribute to the training of local experts.